LOGAN, Utah – Campbell Scientific, with 35 years of world-class measurement experience, is pleased to announce a new open path analyzer, the EC150, for measuring absolute densities of carbon dioxide and water vapor. This sensor was designed to produce high-quality measurements in the field and to work closely with Campbell Scientific’s other flux system components to create fully integrated eddy-covariance flux systems. As a stand-alone analyzer, the EC150 simultaneously measures absolute carbon dioxide and water vapor densities, air temperature, and barometric pressure. 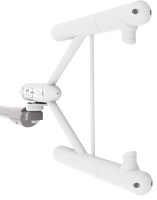 With the optional CSAT3A sonic anemometer head, it also measures three-dimensional wind speed and sonic air temperature. Special consideration was given to the analyzer’s shape, resulting in aerodynamic structures that minimize wind distortion. Their slim design, along with the absence of internal active heat sources, reduces error caused by the effects of body heating. Factory calibration over a wide range of pressures, temperatures, CO2 and H2O densities, and levels of window contamination further reduce measurement error. The sensors provide low-noise measurements and offer an extensive list of diagnostic parameters to warn of questionable data. Sample rates up to 50 Hz are supported, with user-selectable bandwidths to 25 Hz. In addition to the CSAT3A, the EC150 requires one of Campbell Scientific’s flux-compatible dataloggers to create a complete open-path system. Compatible dataloggers include the CR800/850, CR1000, CR3000, and CR5000.